The Alfond Inn in Winter Park Florida is one of the most elegant and wonderful hotels in the state. It features a warm and intimate environment punctuated with gorgeous artwork in all directions. It also features a beautiful central lawn large enough to hold a huge audience for weddings and events. The hotel offers a great backdrop for weddings especially! It was into this environment Phil and Caitlin came with their large group of family and friends to celebrate their coming together as husband and wife. They chose an all-star cast of vendors to create their magical moments. 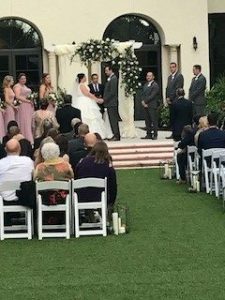 There was the award winning Lon Tosi from the Orlando team of officiants at Sensational Ceremonies, and the fantastic Soundwave Entertainment Systems for the sound and lighting as well as the evening’s entertainment. Blush By Brandee Gaar provided the outstanding event coordination for the event, and Kristen Weaver Photography, when all is finalized, will have delivered their typical outstanding photos for all to view. Cheryl’s Distinctive Creations provide the beautiful floral arrangements throughout the affair, and Sprinkles Custom Cakes outdid themselves once more with an amazing cake prefect for the cutting! The Hons captured everything on video for all to remember the amazing event, and Kristy’s Artistry and Design Team created their magic once again with their fantastic hair and makeup artistry! Over the Top Linen helped to create a magical feel to the reception with their beautiful table linens. Swag Décor helped in that effort as well. This truly is a list of some of the top rated and most sought after vendors in the Orlando area. They helped to create a memorable and gorgeous wedding for this gorgeous couple. Lon Tosi from his office in Celebration, Florida, (the Town That Disney Built) worked closely with the bride and groom to create a custom wedding ceremony that had members of the audience crying. Phil and then Caitlyn had Lon read their special “love note” that they had written to one another. They also placed special messages into a “wine box” during the always beautiful Wine Box Ceremony. On their one-year anniversary, they will open the box, read the letters and drink some wine. Then they will add new letters to the box. That is a great tradition that they will practice each year on their anniversary. It was just a beautiful evening at a gorgeous venue with amazing vendors and a fantastic couple! It just does not get any better than that! Good luck Phil and Caitlin as you walk into your bright future together. My your days together be good and long on this earth!